The Amer Fort has long been the iconic attraction of Jaipur. Located 11 kms from the stunning Pink City, it is a spectacular fusion of Hindu and Mughal architecture. Its location was chosen because the small town of Amer was the centre of the ancient ruling Kachhawa clan before the capital moved to Jaipur. Construction began in 1952 and was overseen by Raja Man Singh I until the project was completed by Sawai Jai Singh I. Most of the ancient buildings from Jaipur’s history have failed to stand the test of time having either been destroyed or replaced. Subsequently the fact that the Amber Fort stands proudly and well preserved is a marvel in itself given the many wars that have taken place in this region’s history. 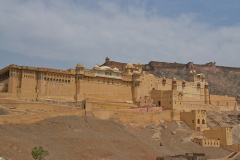 Constructed from white and red sandstone, the materials used help to give the Amer Fort an impression of being incredibly defensive and a solid stronghold. An important aspect in a time when fighting and warring was common. In contrast however, the interior is lavish and beautiful. 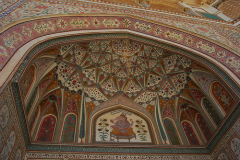 The walls are clad with intricate and colourful murals and frescoes which highlight scenes from daily Mughal life and mosaic artwork is also common throughout the complex. Amer Fort is divided into four main sections which each has its own entry gate and courtyard and can be accessed by a central staircase. Entry through the Sun Gate takes visitors to Jaleb Chowk. This is the first main courtyard where soldiers would host victory parties with their bounty upon return from war. On the right hand side of the courtyard resides the charming Sila Devi Temple. The second courtyard is best known for being the home of the Diwan-i-Am (Public Audience Hall) where the Raja would sit and listen to requests and petitions from his people. 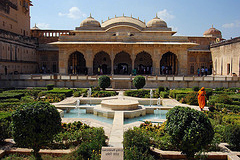 The third courtyard was used as the private residence of the Maharaja and his family. It is resplendent in opulent and sumptuous furnishings and artwork and looks out onto a Mughal inspired garden. The fourth courtyard is where the Zenana (royal women and mistresses) used to reside. There are many rooms so the King was able to visit each one in turn at his whim without anyone knowing who he was with. 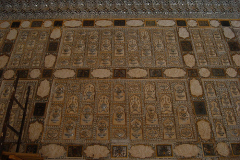 However the highlight for many who visit the Amer Fort is the dazzling Mirror Palace (Sheesh Mahal). The local legend is that just one candle offers enough light to light up the entire hall due to the reflective nature of the mirrors. High up on the hill and located above Maota Lake, the fort offers a mesmerizing view of the outlying area of Jaipur. Most people choose to travel by car on the narrow road that leads up to the main entrance. It is also possible to reach the top by riding an elephant from the bottom of the hill up to the Sun Gate. An impressive sound and light show is also held every night. More than 5,000 people visit the fort every day so go as early as possible to escape the crowds and miss the intense midday heat as you wander around. The Amer Fort is open every day from 9:30am to 4:30pm. As is usual at many heritage sites in India, there is a fee for photography and video.